With the introduction of Windows 7 comes a brand new graphics platform for the application developer and that of course is Direct2D. So far MSDN Magazine has published two introductory articles I wrote about Direct2D. 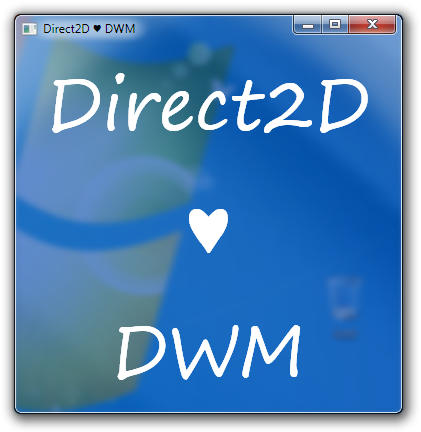 If you haven’t already done so please read Introducing Direct2D and Drawing with Direct2D. I’ll wait. The upcoming December issue of the magazine will feature the next installment which covers some more advanced topics related to interoperability, but for now I thought I’d update the DWM saga for Direct2D as it’s just so simple. Whereas GDI barely tolerated the DWM, Direct2D just loves it.